As a café manager I often struggle to balance perfecting classic coffee drinks and coming up with innovative beverages. I’m constantly tweaking brewed coffee recipes and refining espresso service. At the same time, a significant chunk of my week is spent coming up with drinks to set my café apart. It can be tricky, but by combining our passion for coffee and obsession with cocktail-style drink experimentation, we’ve come up with some amazing drinks. 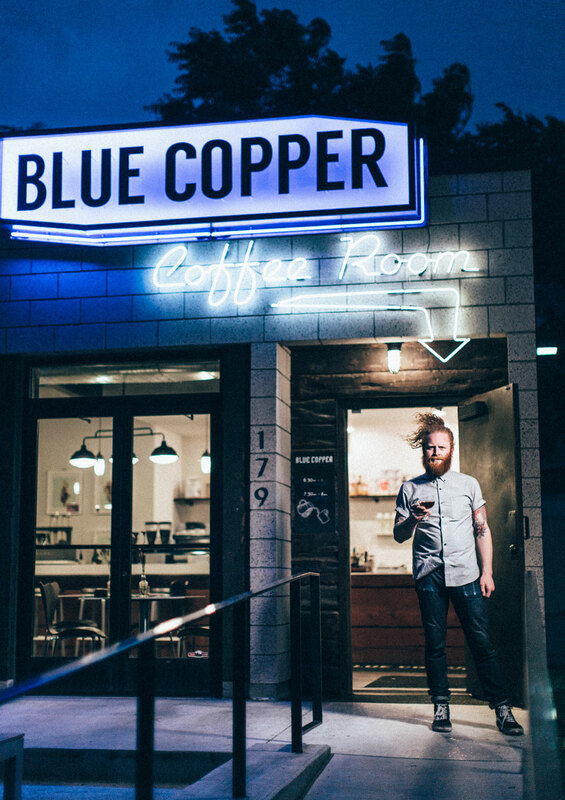 I figured that Zade Womack, barista and specialty drinks manager at Salt Lake City’s Blue Copper Coffee Room, could relate—Blue Copper serves standard espresso-bar fare with occasional cocktail-inspired drinks, too. But as it turns out, Womack can’t relate at all—instead of trying to innovate, he simply lets his second job as a bartender at a cocktail bar, the Rest, bleed into his barista gig in a natural, effortless way. One night, I stop by Blue Copper after closing time with beer in hand, hoping to discuss menu balance with Womack. As I open our beers and perch on a barstool, I tell him that we can hold off on the shop-talk until we’ve put a dent in our drinks. I’ve known Womack for a few years, and I’m pretty sure that drinks are the only things we’ve ever talked about. We end up on the topic of Blue Copper’s one-day-only drink offerings, typically served on Tuesdays. They range from coffee versions of classic cocktails—coffee julep, espresso dark and stormy—to lattes flavored with brown sugar syrup and Fee Brothers whiskey barrel–aged bitters. I ask him how he splits his time between perfecting Blue Copper’s menu and coming up with those kinds of drinks. Womack reminds me that since he started working at Blue Copper—when it was still Nobrow Coffee Werks—much has changed. They moved locations, installed a Steampunk, merged with their namesake local roaster, upgraded their espresso equipment, and still retained their lauded multi-roaster model. In addition to improving on the coffee side of things, Blue Copper has begun offering menu items like cold-brewed cascara iced tea and shrub sodas—fizzy drinks made with fermented fruit, sugar, and vinegar—which Womack oversees. I remind him that the shrubs, which are basically Colonial-era cocktail mixers, are something very new for Salt Lake. “I’m not seeking to be set apart. I really want to concentrate on the quality of the coffee,” he insists. As we talk about various shrubs he’s made, he jumps up from his barstool to pour me a sample—an oleo-saccharum shrub. Following seventeenth-century punch-making techniques, he macerated lemon peels with sugar to extract their oils, but included white balsamic vinegar to provide light acidity. He dilutes the mixture with a few ounces of soda, tops it with ice, and slides it across the bar to me. It’s delicious. When I tell him this, he’s already behind the Strada pulling a shot. He recreates the same drink, but includes an espresso. We both taste it and agree it’s interesting, but tart. So Womack adds some brown sugar syrup, I stir it in with my pinky finger, and we’re left with an amazing cocktail—kind of a sour, kind of a punch. While the creation of this drink looks effortless, it’s because Womack’s packed a warehouse-worth of drink-building materials in his mind, and he knows how they can fit together. His crossover drink-building skills, voracious study of coffee and cocktail literature, and palate for flavor balance automatically set him apart from the non-bartending barista set. “Part of having an understanding of cocktails that really helps with this kind of classic is you understand the taste profile and what you’re looking for within that. I’m like, ‘This is too bright—how do I soften it?’ A little more simple syrup,” he says. After we finish our beers, I continue to prod Womack as to why he doesn’t make these kinds of drinks more often, or add them to Blue Copper’s menu. He mentions that his real interest in terms of coffee experimentation lies in the realm of booze—which, with Utah’s strident liquor laws, can be tough to do at a café. I ask Womack what kinds of things he’s come up with while bartending at the Rest and its upstairs sister bar, Bodega. “Actually, tomorrow I’ve got a beer cocktail event at Bodega where I’ve brought cold-brew into a beer cocktail. It’s rye and dark rum with cold-brew and an IPA,” says Womack. This is the sort of drink he wishes he could serve at the café. “My ideal coffee shop is a bar. My ideal bar is a coffee shop . . . the marriage of the two is a lot of fun,” he says. When your barista is also a bartender, it can be hard to tell the difference between the two—which, in the case of Womack’s customers, can be a very good thing. —Cody Kirkland is the bar manager at Salt Lake City’s The Rose Establishment.